Human pressure on the environment has steadily increased throughout the last few decades, specially in South and Southeast Asia. This part of the world is also particularly rich in biodiversity such that sustainable methods for managing the environment, based on appropriate biological knowledge are in high demand. The present project is an initiative in the emerging area of biodiversity informatics and aims to develop a knowledge base on two major “hotspots” of biodiversity: the rain forests in the Western Ghats of India and the Northern Annamite rain forests of Lao PDR (Myers N. et al., 2000). The knowledge base, built on a tree species identification system (IDAO), will be instrumental in understanding and assessing the biodiversity of these highly significant areas, as it would provide and facilitate dissemination of scientific and traditional knowledge. The knowledge base will draw from existing reference herbariums, which will however need to be completed with extensive field trips. Developed as an open source web-based application, the knowledge base will be made available on-line, on CD-ROMs for personal computer platform as well as on Simputer, a PDA operating on Linux with local language support. The result would primarily address the needs of stakeholders that are involved in maintaining and preserving these diverse rain forests, including the large scientific community working in these geographical areas and also the government agencies. The partnership builds on the foundations of the pre-existing scientific collaboration between the various partners who have specialized in developing IT&C applications for taxonomy (IDAO) on one hand, and taxonomy itself on the other hand. The existing collaborative efforts are both at institutional level and through regional networks like European Tropical Forest Research Network (ETFRN). The project also brings together the partners’ demonstrated capabilities in implementing similar actions, viz. a) the development of IDAO, the core module of the identification system by CIRAD, b) the application of IDAO in the field of mangroves species, funded by the European Commission and implemented by the IFP and the CIRAD. To promote the development of Open Source based IT&C tools in biodiversity informatics for southern countries through a transfer of know-how between Europe and Asia. To promote cooperation between two southern countries in the area of biodiversity informatics, namely Lao PDR and India. To build two knowledge bases (an open-to-all web-based application and two CD-ROMs): one for the tree species of rain forests of Western Ghats (India) and another for the rain forests of the Northern Annamite Mountain range of Lao PDR. For this IDAO technology, an existing multimedia species identification software, will be used. To establish open data standards and protocols for the common use of species descriptions, terminology, composite drawings and common software architecture. To adhere to the standards defined by the Global Taxonomy Initiative (GTI) from the Secretariat of the Convention on Biological Diversity . The knowledge base created will be shared with global databases like “Global Biodiversity Information Facility” and “Species 2000”, a Catalogue of Life Program . To translate the identification tool in the respective local languages. This will help the capacity-building in taxonomy, the self-training initiatives and also contribute to the effort to preserve traditional knowledge in the southern countries. To transfer the identification system to “Simputer”, a low-cost computing device based on Open source software which allows for regular updates of data through the web-based database. The project envisages the initiation and sustenance of cooperation between the Asian and the European taxonomic communities. Indeed, it brings together and assimilates into a knowledge base the information already available in both regions. Moreover, it will provide a major capacity-building tool for young researchers and trainees, and serve as a major aid for the conservation of biodiversity in these two hotspots of biodiversity. The aim of this first activity is to open a website which will disseminate information on the project, including software and species description updates. A first workshop will be organized to establish species description standards and to select the appropriate IT database format. The list of the tree species of the Western Ghats (India) and the tentative list of tree species of the northern Annamite rain forests of Lao PDR will be defined during the workshop after discussions with partners. The second activity aims at collecting extensive data on the tree species in both the hotspots chosen for the BIOTIK Project. Aspects such as diversity, conservation needs (like concentrating on national biodiversity conservation areas - NBCAs), endangerment and the need for essential cataloguing will guide in the defining of the list of species and physical locations. These areas will be covered extensively in the field trips which is time-consuming. The aim of the third activity is to prepare and to aggregate all the documents (descriptions, hypertexts files, photography, drawings, scans) and the IDAO software for each of the areas. This phase is mainly oriented on the computing part of the project and will be focused on preparing the interactive interface and the iconography in a digital format. The aim of this activity is to feed the website with the data produced by the project, on the one hand, and with the different versions of the two implementations of IDAO on the other hand. The documents (descriptions, hypertexts files, photography, drawings, scans) will be widely disseminated, as well as the IDAO software for each of the areas. The aim of this activity is to port the knowledge base to the Linux-based PDA, the Simputer. This will involve porting the core application IDAO to the Simputer platform using cross compilers and using the drawings and the translated texts. The aim of the sixth activity is to collect feedback based on the training in the use of the identification system. This will greatly improve the design and the content manipulation of the system. The needed changes will be incorporated frequently and the feedback collected again, as a continuous process. The testing done with the scientific community should provide valuable feedback on the content and the organization of data in the CD-ROMs. 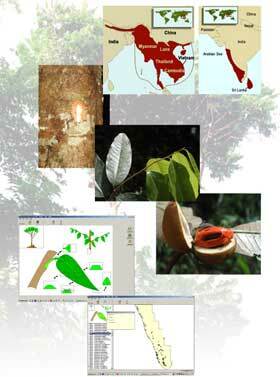 Click here for consulting the list of species for India and Laos. Click here for consulting the online version of Biotik - Western Ghats Application.